This cold weather warrants a good bowl of bisque! Unfortunately, you can’t go to any restaurant and order bisque without it containing flour. My husband and I recently ate at Texas de Brazil and my husband was so impressed with their lobster bisque. I was not. After one taste I knew it was loaded with flour and I was wondering where the lobster was?!? So I decided to make my own. I have a Cauliflower-Potato Bisque recipe in my cookbook that is delicious so here is another great bisque to add to your arsenal of grain-free recipes! In my recipe, the thickening comes from cauliflower. Don’t worry, if you don’t like cauliflower, you would never know it is in there! The key to a good bisque is to blend it well, unless you like chunks in it. I used an immersion blender or you could also do it in batches in a blender before adding your shrimp or other seafood. Craw fish season is approaching and in the next bisque I make, they will be the star ingredient! Don’t worry if you can’t have shrimp, just omit them. This would also be great with lobster or crab meat. In a large pot over medium heat, add butter, onions and bell pepper. Saute for 10 minutes, stirring occasionally to ensure vegetables don’t burn. Next, add garlic, stock, water and cauliflower. Bring to boil and then cover and cook on medium heat for 10-15 minutes or until cauliflower is very tender. Turn heat down to low and add tomato paste, cream cheese, heavy whipping cream and white wine. Using immersion blender, blend until desired consistency. Add salt, cayenne and black pepper. Stir well and taste for seasonings. Add more salt if needed. If using pre-cooked shrimp, add them at this time. If starting with raw shrimp, heat an additional 1 tbsp of butter in a medium frying pan. Add chopped shrimp and cook for 3-5 minutes or until shrimp are done and pink. Add shrimp to bisque and stir. Again, taste for salt. For garnish, I used about a 1 teaspoon of heavy whipping cream and “drew” on top of the bisque! Remember, we firs eat with our eyes so make it look great! 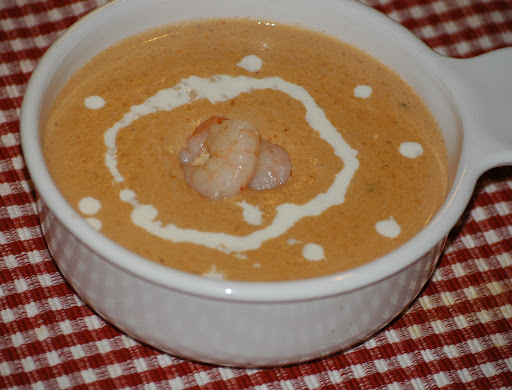 **Note: I do not add the raw shrimp to my bisque because it will give too much of a fishy flavor. By cooking the shrimp before adding them to the bisque, the flavor of the shrimp is much more mild. Also, if you want a smooth Shrimp Bisque, you can use the immersion blender after the shrimp have been added. I personally like the bits of shrimp. 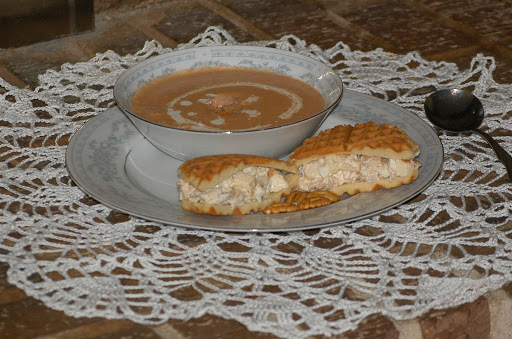 Shrimp Bisque with Apple- Chicken Salad served on my Tasty Sandwich buns made using a waffle iron.